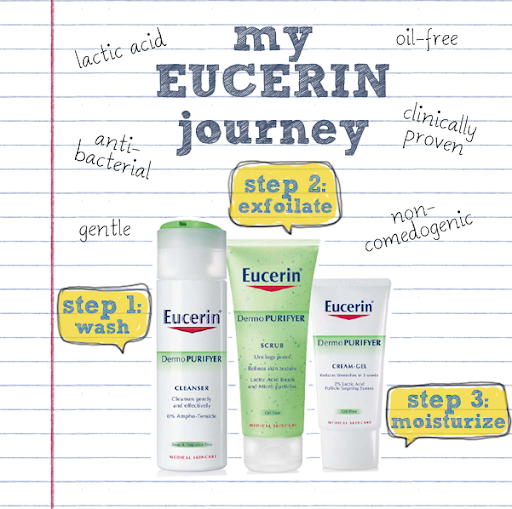 When The Sample Store emailed me an application to review Eucerin products, I immediately jumped at the chance. 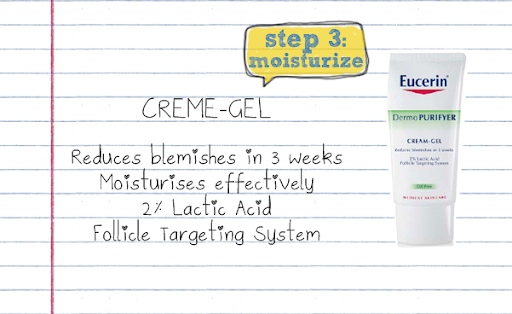 I have been using the Eucerin DermoPURIFYER Creme-Gel for about 2-3 years now (I wrote a little paragraph on it a while back.) and to me, it's an absolutely fab product for maintenance. So you can bet that I was extremely thrilled when my application was accepted and the products were sent to me on the 16th. The range is oil-free, has anti-bacterial properties and is non-comedogenic. It prevents skin irritation and is compatible with most acne medication. 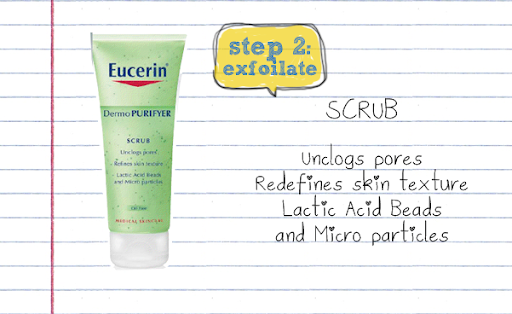 The cleanser contains salicylic acid, while the scrub and the creme-gel have lactic acid in them. Salicylic acid is probably the next most common ingredient found in over-the-counter medications for acne in drugstores here, with the first being benzoyl peroxide. But please don't quote me on this. It's just an observation that I have made over the years. 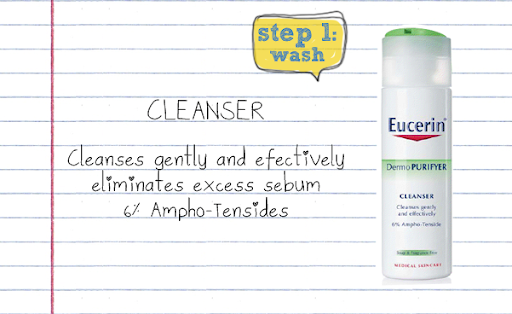 I LOVE, LOVE, LOVE the fact that the cleanser is soap-free! Those that aren't always leave my skin feeling too clean, tight and dry. So this is really awesome! (I also love it that I can keep my eyes open when washing my face!) I won't exactly say that my skin feels 'supple' after usage, but it definitely doesn't make my skin go dry, which is a major plus point for me. For those who have tried Cetaphil, yes, this feels similar to Cetaphil. But do note that Cetaphil does not contain any acne-fighting ingredients. The cleanser is supposedly good for removing makeup as well. But I find that, in this area, it lacks. You still do need a makeup remover to get rid of your makeup before using this. Lactic Acid beads deliver lactic acide directly where blemishes originate. Scrubs are really meant to use once or twice a week because your skin takes time to remove itself. But for the purpose of writing this review, I have been using this almost every other day, on a dry face (I find that scrubs are more effective on a dry face. Perhaps, due to more friction being generated? Do take note to be extra gentle then.). The scrub leaves my skin feeling very smooth. As for whether it reduces blackheads and blemishes, I can't really say much about that, having used it for a short while only. The beads are small and I don't find it the least bit harsh. It stung a little around the sides of my nose at the beginning but the stinging feeling soon subsided. I didn't notice any brightening effect, like the Skinfood's scrubs. But that's really fine with me, since the brightening effect fades off after a while. Okay, THIS, this I absolutely LOVE! I mean, I have been using this for an incredibly long time already! Way back when it was under a different packaging! This helps to maintain my complexion. For me, this isn't good for killing off spots that are threatening to rear their ugly heads or have already made their presence known to the whole entire world (I strongly recommend Eryacne for zits of all sorts.). It is a little slow and ineffective in this area. But yes, I do believe that it reduces the frequency of the occurrence of blemishes. Another thing that I like about this is that it is very moisturizing. Thumbs and toes up for that because most of such treatments can be rather drying. The range also contains a toner (200ml), $21.20, and a cover stick (2.5gm), $26.00.